Please Take Note: This is a review of the game’s final prototype. The art, game bits, and the rules discussed are all subject to change. The game is being reviewed on the components and the rules provided with the understanding that “what you see is not what you might get” when the game is published. If you like what you read and want to learn more, we encourage you to visit the game’s web page or visit the Kickstarter campaign. Now that we have all that disclaimer junk out of the way, on with the review! Experimentation is the key to success and victory! After years of toiling away in an undisclosed government lab, you have finally been able to make a name for yourself. Grant money is starting to roll in and you have procured your own lab and staff! As the owner of your own lab, you get to discover even more elements and colleagues in the scientific community are on hand to assist. But the competition has become fiercer! You must strive to be the best in your field or your new lab will have to shut down! 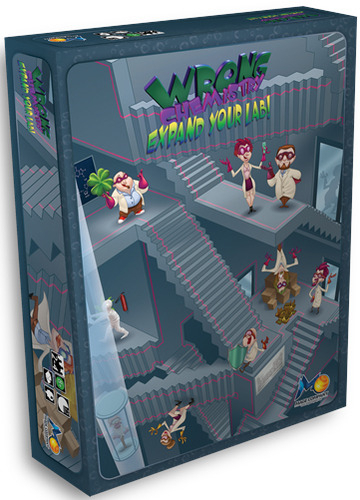 Wrong Chemistry: Expand Your Lab, designed by Tony Cimino and to be published by Mage Company, is an expansion to the card game, Wrong Chemistry. The expansion is comprised of 66 Element cards, 10 Scientists cards, 1 Element of Surprise card, 1 Transmutium card, and 12 Nobel tokens. The expansion introduces all new elements not included in the base game, helpful scientists that can be used to provide players new actions, and allows for a 5th player to join in on the fun. Note that it’s assumed you are familiar with the base game. If not, please give our review a read or none of the following is going to make any sense to you. As this is a review of a prepublished game expansion, we will not comment on the game component quality. 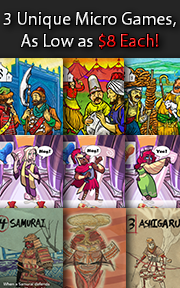 What we were provided uses the same illustrations, icons, and text as the base game and its available expansions. This expansion introduces a number of new play options that immediately become available to the players. They are summarized here. The game expansion includes a lot more Element cards for the players to attempt to duplicate. 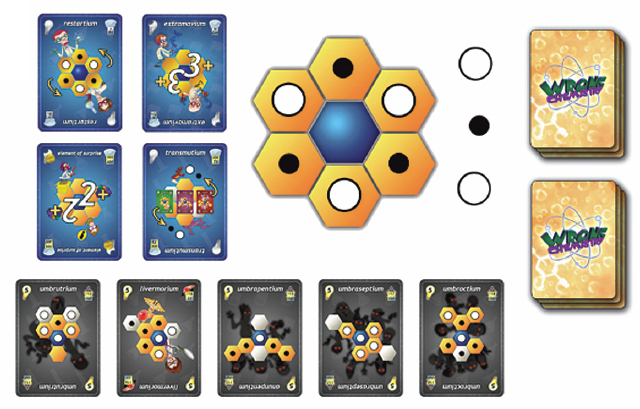 Out of the new Elements cards introduced, the majority are similar in every way (except the Molecule configuration illustrated on the card’s face) to what is already provided in the base game. What is brand new are the 5 new “Black Element” cards that are worth a whopping 5 points at the end of the game! 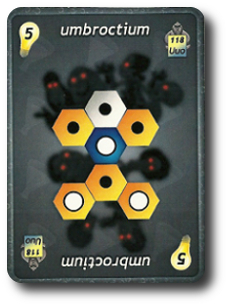 As you can probably guess, the Molecule configuration on the “Black Element” cards are exceedingly difficult to match. In addition to the already available ways for the players to spend energy to take actions, the following new action is available to a player. At the cost of spending energy, of course. Flip Hex Tile: For one point of energy, the player can flip 1 empty hex tile to its opposite side. One side of the hex tile is yellow and the other side of the hex tile is grey. The base game included the “Restartium” and the “Extramovium” special elements that allows the players to take special actions. The expansion introduces 2 new special elements that are summarized here. “Transmutium” Element: For one point of energy, this special element allows the player (once per turn) to change the game board elements (hexes and wooden discs) to match any previously scored Element card in the player’s score pile. Like the “Restartium”, the “Transmutium” Element card is tipped to its side to show it has been used. At the end of the player’s turn, it’s tipped back to its normal position. “Element of Surprise” Element: This special element allows a player to take a special turn at the end of their opponent’s turn. When an opponent is done taking their turn, all the other players (in turn order sequence) can spend 1 Nobel token on their Scientist card or search through their score pile for a card of their choice and place it in the discard pile. The player now has 2 points to spend for actions and they must be used now. 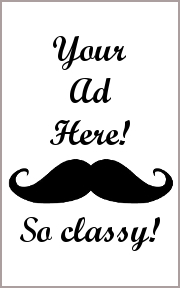 A player does not spend an energy when paying for the Element of Surprise. When using the “Element of Surprise” Element, gain 1 extra energy. The “Transmutium” Element can be used without spending an energy. An empty hex tile can be flipped to its opposite side without spending an energy. An empty grey hex tile can be moved for free to any adjacent location. Finally, this game expansion allows for a 5th player to join at the table to compete for the title of “Top Scientific Dog”! If playing the base game with the expansion, additional set up steps must be taken. They are summarized here. Gather all the Nobel tokens and place them in a central pile. All players have access to this pile of Nobel of tokens throughout the game. Separate the Scientists cards and shuffle them. Deal out to each player 2 Scientist cards each. Players keep one, placing it in front of them face-up, and return the other. All returned Scientist cards and any undealt Scientist cards are returned to the game box. 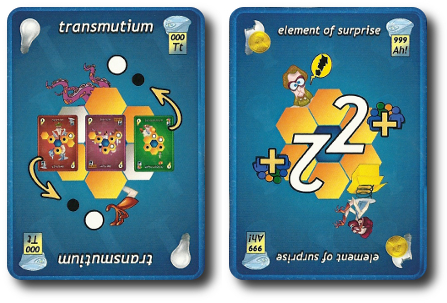 Place the “Transmutium” and “Element of Surprise” Element cards face-up next to the “Restartium” Element card and the “Extramovium” Element card. Underneath this row of cards, place the 5 “Black Element” cards, face-up. Combine all the Element cards together and then separate them by their Idea value (1, 2, or 3) which will result in 3 separate decks. Shuffle each deck and deal to each player 2 Element cards worth 1 Idea value point each, 1 Element card worth 2 Idea value points, and 1 Element card worth 3 Idea value points. This should result in each player being dealt 4 Elemental cards. Then combine the three Element decks, shuffle them, and create two roughly equal decks, placing them face-down. Players can draw from either one of these two decks during step 2 of their turn. When using the expansion, your game playing area might look like the following when fully set up. To determine the first player, the player who has the oldest date on their Scientist card goes first. For the most part, the game is played in the same fashion as the base game with the following exceptions noted here and above. An “empty hex tile” can be either yellow or grey when it’s moved. The only hex tile that cannot be moved or flipped over is the Center hex tile. The “Black Element” cards are free for any player to claim. All a player need do is match the Molecule configuration to the game board on their turn and they can place the “Black Element” card in their score pile. The game does not end until all 5 of the “Black Element” cards have been claimed. When the last “Black Element” card is placed in a player’s score pile, the game immediately ends and the players count their total points as noted in the base game. In case of a tie, the player with the most “Black Element” cards wins. Several game variants are included with the game expansion. As always, these are optional and can be included whilst playing or completely ignored. Extra Points for Scientists: Any player who hasn’t discarded their Scientist card at the end of the game is awarded 3 extra points for each Element card category they have the majority of. An Element card’s “category” is defined by its color. Scientific Committee: This game variant mixes all the Scientist cards from this expansion and the Scientists from the Wrong Chemistry: Scientist game expansion together after players have selected their own personal Scientist. All the Scientist cards not selected are shuffled together and 5 are dealt face-up. These 5 Scientists represent a committee who are willing to lend a hand to the players. 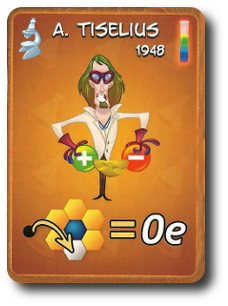 Players can then place a Nobel token on their own Scientist or any Scientist on the committee to activate their special ability or used to activate the “Element of Surprise”. When all 5 of the Scientist cards have been used (having been activated 3 times each), they are discarded and another 5 Scientist cards are dealt. Fair play: This game expansion keeps the Element cards separated by Idea value. On a player’s turn, they can select to draw 1 card from any of the 3 available decks. This way, players can tailor the Element cards in their hand. To learn more about Wrong Chemistry: Expand Your Lab, visit the game’s web page or visit the Kickstarter campaign. The game expansion was not well received by the Child Geeks. In fact, when we introduced it, all the Child Geeks said they liked the base game much better and asked us to remove all the game bits from the expansion. When we dug a bit deeper in hopes of understanding why the Child Geeks didn’t care for it, my 8-year-old said it best. “This adds a lot more to the game that makes it more complicated. I am happy with the original.” The same sentiment was shared by all the Child Geeks. Turns out that the game expansion added just a bit too much weight to the game that made it feel heavy and decidedly less fun. The Child Geeks voted to reject the game expansion. The Gamer Geeks did a complete 180 degree turn when it came to the expansion. Where they once found Wrong Chemistry to be too light and lacking much in the way of depth, the expansion opened up the game play to a lot more opportunities for strategy and tactics. The increased game length didn’t bother them because the game felt deeper and more interesting. One Gamer Geek said, “This doesn’t even feel like the same game when you add the expansion. They should have renamed the game to Wrong Chemistry Part 2.” All the Gamer Geeks agreed that the game, as whole, benefited from the expansion and should never be played without it. For the first time, all the Gamer Geeks agreed that Wrong Chemistry was worth bringing to the Gamer Geek’s table. Wrong Chemistry already has two expansions, but Wrong Chemistry: Expand Your Lab dwarfs them both. The Element cards introduced in the Wrong Chemistry: Element game expansion have no impact to the base game or the base game with the new larger expansion. It’s not clear if the Scientist cards from the Wrong Chemistry: Scientist game expansion should be used with the new expansion rules or not, but they are briefly discussed in one of the game variants. We mixed them up during a game with the expansion and didn’t find any problems whatsoever. There was never any visible indication that all the expansions couldn’t work together seamlessly with the base game. Good news all around for those players who already have the expansions! Wrong Chemistry: Expand Your Lab has an interesting mix of new and existing game mechanisms. Several of our playing members have already touched on how different the base game feels with the expansion included. I agree with several of the Parent Geeks and the Gamer Geeks that the game is much deeper, more complicated, and a lot more engaging with the expansion versus without. But I am not convinced that it made the game better. I think it just made the game different. For some, “different” equates to “better”, but not for me. I liked the base game’s simplicity and casual game play. Wrong Chemistry with the expansion feels bloated and unwieldy at times and I really don’t care for the additional time necessary to win the game, either. The average game playing length jumped to 45 minutes, with some games with younger and less experienced players lasting close to an hour. For the more casual Parent Geeks and the Child Geeks, that was just too much change that wasn’t asked for. For the Gamer Geeks, it was several steps in the right direction. Perhaps the best aspect of the expansion is that it allows the owner of the game to tailor it to their group. If a casual game playing experience is warranted with a smaller group of people, the base game is all the player needs. If a more complicated game with more options is desired, the expansion can be added. This makes the overall game, with all the expansions included, a versatile offering for any gaming table. Now one game can fit the requirements of all the players. The only downside is that Wrong Chemistry cannot be all things to all players all the time. You’ll have to pick and choose which of the two sides of the coin you’ll want, be it an easier game or a much more involved game. Regardless of which side of the coin is selected, the players win. Tagged Game Expansions, Gamer Geek Approved, Prepublished Games. Bookmark the permalink.